Around a week back, the Pointy-Haired Dilbert aka Chandoo wrote a blog entry about the “must read” section of a famous Indian news channel’s website. That just corroborated the general sentiment prevalent among people who care about journalism and news and its present state in the country. News channels have been serving us items about ‘ghosts’, supernatural ‘incidents’, television soaps news, page 3 type parties, kissing scandals, timeslots dedicated to comedy shows, while keeping journalistic professionalism at bay. A ghost story or a faith story is covered with sensationalism, but without any coverage on the rational angle as is done by any self-respecting news agency. Page 3 scandals are covered with juicy gossip intact. And half the time when you switch to these channels they are either discussing cricket with a has-been cricketer, or showing a comedy gig featuring one of the new crop of Indian stand-up comics. 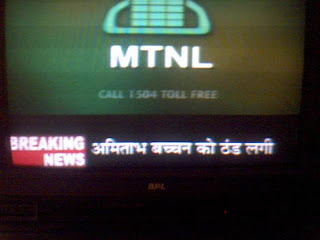 The “Breaking News” ticker reads: “Amitabh Bachchan ko thand lagi” (Amitabh Bachchan catches cold). Well, its what they say .. news is simply stating facts as they are. Amitabh Bachhan ko thand lagti hain :-). Business Implication – Reid & Taylor will launch a new line of sweaters / woolen suits. Next Next post: Irony? Hypocrisy? Need a job?